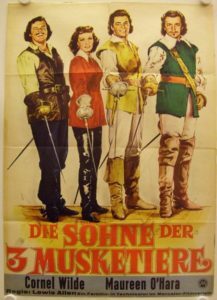 This sequel to The Three Musketeers was made by RKO a couple of years earlier but not released until 1952, possibly to get it out of the long shadow of the 1948 MGM version. There have been dozens of screen versions of The Three Musketeers, but Hollywood has never quite figured out how to adapt Dumas’s sequel, Twenty Years After, into a successful film. This story does use some of the elements of that novel, in particular France on the verge of civil war after the deaths of Louis XIII and Richelieu, with the aging Queen Anne trying to preserve order until Louis XIV can come of age, while fractious nobles, personified here by the scheming Duke de Lavalle (Robert Douglas) vie to seize power. However, instead of having the novel’s older versions of the four musketeers step in to sort things out, this tale calls on their grown-up children to rise to the occasion. Is this Hollywood ageism at work? Well, it certainly isn’t sexism, as one of the younger generation is Athos’s daughter, Claire (Maureen O’Hara), and she’s as good with a blade of any of the men—with the possible exception of the young d’Artagnan, who is, after all, played by an Olympic fencer (Cornel Wilde). But let’s not gloss over the point: this is the first serious movie representation of a female swashbuckler who is the equal of the men—and accepted by them as such! There’s still plenty of flirtation toward Claire by the young Aramis and d’Artagnan—I mean, these are musketeers—but it’s not condescending, and she gives as good as she gets. The ones who underestimate Claire are the villains, and they learn to be sorry they did. The best moment in the picture is when Lavalle, who’s strong-armed the queen into letting him marry Princess Henriette, leads her to the altar, lifts her veil, and finds that Claire has taken his bride’s place, and the princess is safely in the hands of the other musketeers. Claire, faced with the wrath of the most powerful man in France, just laughs in his face. The plot here is nothing to write home about, being the usual series of swordfights, kidnappings, escapes, pursuits, betrayals, traps, and rescues, but the writers are clearly admirers of Dumas, and there are a number of fun call-outs to the novels, e.g., minor characters named Planchet and Rochefort, and at one point Claire, hoodwinking some guards, assumes the name Countess de La Fère—the family name in the novels of her father, Athos. Plus the costumes are good, Wilde does some nicely acrobatic swashbuckling, and the blue tabards of the King’s Musketeers come out of the wardrobe for the grand finale. All fine, but it’s Maureen O’Hara who walks away with the prize for this film.